A classic London inner-city park with large open fields, tree-lined avenues, and ponds bordered by well manicured gardens. A haven for east London runners. As one of London’s oldest public parks, Victoria Park was established in 1841 by Queen Victoria after she received a signed petition from 30,000 Londoners requesting the park be set aside for public use. And by the number of locals who still frequent it, it’s as popular as ever. 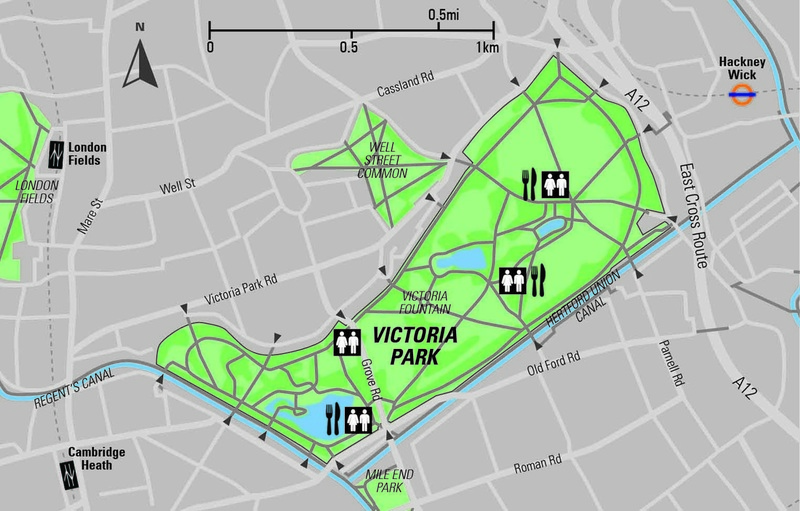 Aside from its own virtues, Victoria Park makes a great connection point between various other parks (including Mile End which boasts a good athletics track, Lee Valley and Olympic Park nearby) and the canals, two of which (Regent’s and Hertford Union) run alongside. Use the many gates around the park to access these extra options. The park itself is divided into two sections by Grove Road that cuts through its middle, running north to south. The western section has more developed gardens and, for the runner, has a main wide sealed road around its circumference (which also has a dirt trail and a crushed limestone path alongside). There are several sealed paths through the interior that wind around the main lake and cross over a couple of bridges making them well worth exploring. The eastern portion of the park is more open and has the same wide path around its circumference (with accompanying dirt track) but in its interior, apart from a playground and a monument or two, are large playing fields. These are perfect for doing strides or finding your own favourite loop on the soft grass. A full loop of the sealed perimeter road is about 2.7mi. Victoria Park Harriers and Tower Hamlets Athletics Club has its home in the northeast corner of the park in St Augustine’s Hall. The Pavilion Café offers organic food and coffee in the park’s southern corner. This wonderful short film was recorded in Victoria Park. As well as giving us a great insight into the thoughts and deep emotions of regular runners, it also gives us an insider's view to the park itself. Surface: Sealed, limestone, dirt, & grass. Traffic Warnings: It gets busy in summer and take care crossing Grove Road. Times: Open 7am to dusk. Toilets: Near the cafe (by the lake) and in the centre of the eastern portion of the park. Rail: Homerton Station (London Overground, 0.5mi N); Hackney Wick (London Overground, 0.4mi NE); Mile End Tube Station (Hammersmith & City, District, and Central lines, 0.7mi S), & Cambridge Heath National Rail Station (Greater Anglia line, 0.4mi SW). Bus: 8, 276, 277, 339, 388, 425, & N8. Thumbs Up | Access to many trails both inside and outside the park. And lots of other runners to keep you company (or race!). Thumbs Down | The dusk closing times make this a lunchtime or before-work option in winter.